This Black Bean Beef with Broccolini and Egg Fried Rice is a brilliant dish when you don't want to spend hours in the kitchen but still want to serve up something tasty that impresses! The recipe includes fermented beans, shoaxing wine, garlic and chilli. And did you know that the secret to perfect egg fried rice is cold rice?! Heat a large fry pan over a high heat then add the oil. Add the beef, broccolini garlic, ginger and cook for 2 to 3 minutes. Add the beans and chilli for 1 minute, stirring continuously, then add the wine, sesame oil and soy sauce. Bring to the boil to allow it to thicken. Add the coriander. Meanwhile heat another pan until it is hot then add the rice. Whisk the eggs with the soy sauce and sesame oil then add to the pan and cook for 2 minutes. 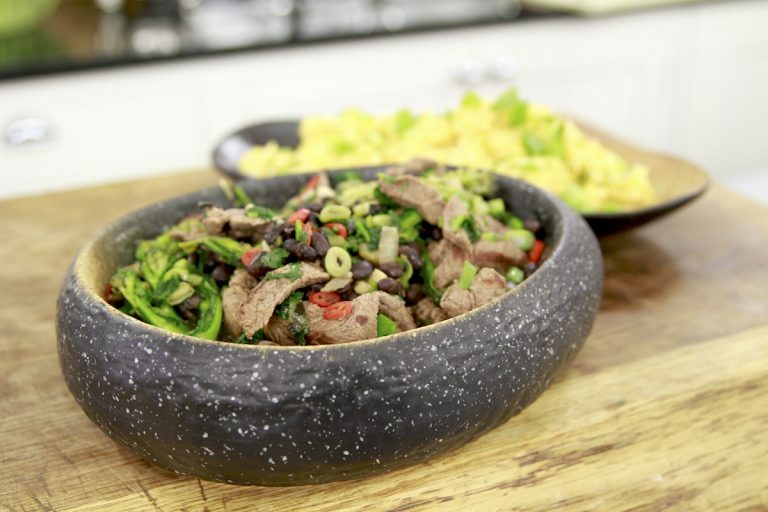 Serve the beef and rice sprinkled with spring onions and coriander.